Pretty good week for gold, eh? (For those of you non-Canadians, “eh” is how we end every sentence, and it is entirely rhetorical in nature; in most cases we don’t expect a response. In this case, it was a pretty good week, eh?). We are back within spitting distance of $1,000 per ounce, yet again. Since March, 2008 there have been at least three other serious attempts to crack through the $1,000 barrier, none of them successful. We are now witnessing the fourth such attempt. Will this one be successful? Ultimately, yes, of course it will be successful. 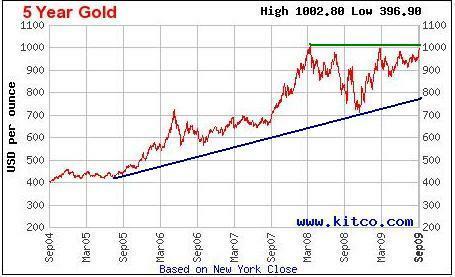 Will we see $1,000 gold next week? I have no idea. Obviously $1,000 is a big psychological barrier, but it is also imposing technically as well. 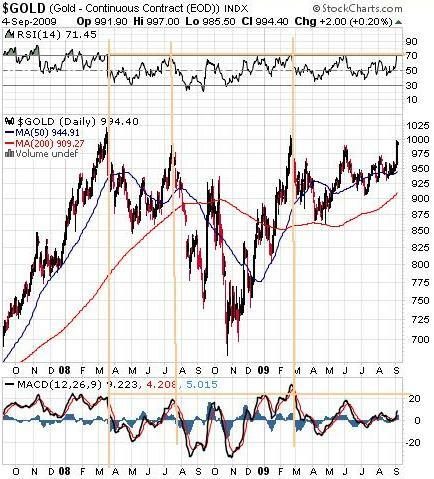 The last three “peaks” in gold saw an RSI around the 70 level, and gold’s RSI is currently at 71.45; the MACD has peaked around the 20 level on past peaks, and it’s less than half that level now, so further upward movement is possible. My guess is that a jump of $50 in one week is too far, too fast, so a pullback is probably in order before we make a final run through $1,000. However, September is a historically strong month for gold, before weakness sets in in October, prior to the traditionally strong first quarter, so anything can happen. As readers of this blog know, I have been sitting on cash for many months. I have bided my time. I killed time last week by writing about Ted Kennedy: The Lion. I even spent four days last weekend in Washington D.C. I could have walked from my hotel room to the Capitol last Saturday night to watch the Ted Kennedy funeral procession. (I didn’t; the Embassy Suites Hotel in Washington D.C. has Happy Hour from 5 to 7 each night; free drinks and snacks for the adults and the kids, so my kids decided to rent Night at the Museum: Battle of the Smithsonian while my wife and I watched the funeral from Arlington on T.V. The kids loved the movie, since we had spent the day touring the Smithsonian, so they recognized many of the landmarks in the movie. But I digress). (Actually, I will digress some more. My two boys, aged 9 and 11, had never flown on a plane before. Upon take off, the oldest sitting with me, and the youngest with his mother, they both independently remarked that the ground looked like “Google Earth“. When we were kids in a plan we said that “everybody down there looks like ants; now my kids vision of the world is shaped by a search engine. I don’t know what that means, other than our children view the world differently than we do). (Continuing on this digression, my 9 year old son, bored with his parents having a few free drinks and ignoring him, decided to ride the elevators, which are quite beautiful at the Embassy Suites. 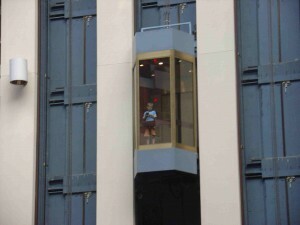 Obviously he is an anally retentive accountant type (just like his father), so he decided to do a survey of how many people got on at each floor. I could have told him the busiest floor would be the first floor, but I didn’t spoil his fun. After an hour with a notepad, he determined that floor one was the most popular, and interestingly floor nine was the second most popular floor). (One final digression. We visited the Museum of Crime and Punishment, where I learned that one out of 31 adult Americans is either in jail, on parole, or on probation. I have no idea if that statistic is true, but if it is, that’s staggering. What a jolt in the arm it would be to the economy if all of the petty thieves and minor drug offence convicts were released and became productive members of society. Taxes would drop big-time. Based on my observations the number one industry in Washington is security; every building has numerous security guards, just standing there. Again, what a waste of money). End of digression. (Although you should be used to it by now. I commented on my August 2008 vacation at Delawana Inn, and my August 2007 vacation in Nova Scotia and parts East, timed beautifully with a market crash as I recall). Obviously a better buy point was last November, or in April of this year, but given the risk of a general market melt-down, which I continue to expect this fall, being prudent isn’t a bad move. 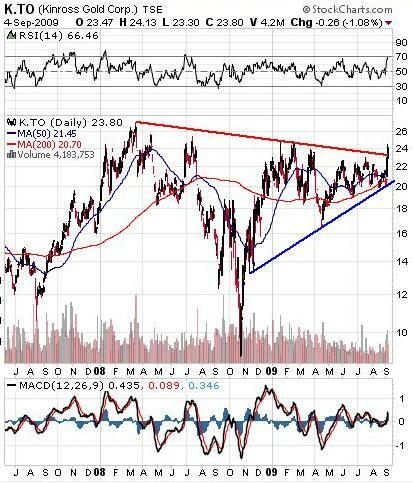 Obviously gold stocks like Kinross are looking toppy and oversold (just like the gold chart), but that doesn’t mean they can’t run further, so I will be begin to build my position now, and buy more on dips. Last year gold got hurt in a “flight to quality” as investors moved into the perceived safety of the U.S. dollar. This year investors are moving to gold as a hedge against inflation, since you would have to be crazy not to believe that trillions in government spending isn’t inflationary. The key point here is that inflation will not appear overnight. It takes time for “stimulus” to make it’s way through the system, but that is the inevitable result, so beginning to take a position now is prudent. A general market collapse will crash everything, at which point I can use my cash reserves to complete my buying programs. And yes, I still expect a market crash. Another five banks collapsed this week, according to the FDIC. Unemployment is at a 25 year high, and that’s even after ignoring the people who have given up looking for work. Even the President realizes he will need to create a crisis to get health care passed, and that sense of crisis can’t be good for the economy either (code word: H1N1; the perfect crisis; but again, I digress). Options expiry is September 18, so I may buy a few more blue chip gold and silver stocks, and do some covered writing as options expiry nears to lock in the gains. That’s the game plan. For my Canadian friends, have a happy Labour Day, and a happy Labor Day for my American readers; thanks for the hospitality in your country last weekend (everyone was very friendly), and have a good week. Tagged as: digress, Gold, vacation, Washington D.C.